3. The binocular has orange-yellow filters. They should be fitted on the eyepieces to decrease the dazzling of the strong sunlight when observing under the strong sunlight or to improve the contrast of object when observing in the thin fog. ( You can choose alternative filter according to your own need ). 4. In order to adapt the binocular to the observer's interocular distance, turn the right and the left prism assemblies to adjust the interpupillary distance of the binocular.Hold the hand wheels and turn the sphere by 180° ( location being perceived ). resulting in the change of the magnification of binocular. 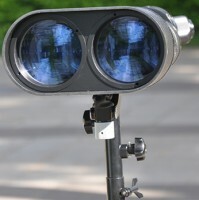 To adapt the binocular to the diopter of the observer's eyes, turn the scale ring seats to carry out the adjustment. 5. 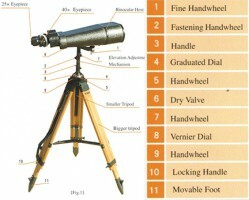 The binocular should be fixed tightly on the tripod by a fastening handwheel 2 in Fig. 1 .The rough and fine elevation adjustments may be made in observing an object. The quicker elevation adjustment in a bigger range may be made when hand wheel 7 in Fig.l is loosened. For fine elevation adjustment, fine handwheel 1 in Fig.l is turned when handwheel 7 in Fig.l is fixed. 6. For measuring the included angle between objects. firs loosen the handle 3 in Fig. 1. aim the center of the cross on the reticle at one object, make the zero division on the graduated dial 4 in Fig.l coincident with that on vernier dial 8 in Fig. 1. and clamp tightly with the handwheel 5 in Fig. 1. then aim the center of the reticle at the other object and read it out on the graduated dial. 7.Handle 3 in Fig.1 should be tightened when no turning is required for the binocular in the observation of a fixed object. 8.If the binocular is to be placed on the platform in use. turn the handwheel 9 in Fig.l on the bigger tripod Brake down the binocular, and use them together with the smaller tripod. Dry valve 6 in Fig. 1 is used for sucking and filling dry nitrogen if special equipment is available. Three feet of the tripod, which have locking devices, can be lengthened and shortened freely. Release the handle 10 of locking devices. three movable feet 11 can be adjusted respectively according to the installation height and terrain, so that the tripod is basi­cally leveled, and then finish the installation of tripod by using the locking handle. The installation of tripod should be done steadily and reliably. Turn the handwheel 9 counter clockwise and insert the square shoulder at the bottom of the graduated dial into the square slot of the handwheel, and then trun the handwheel 9 clockwise to finish the installation of graduated dial. As shown in Fig., insert the seat hole of the elevation adjustment mechanism of the binocular into the graduated dial, and lock by turning the locking handwheel 2,and it is finished. As a precision optical instrument, the binocular should be carefully kept and maintained to ensure it is always in good technical conditions. 1 .The binocular should be kept clean either in use or in storage. After using, the surface of the glass should be cleaned with a brush first, and then lightly wiped with clean flannelet. Do not wipe it with fingers, dirty cloth or paper. The surface of the metal parts should be often kept clean as well. Any metal surface with paint peeled of or unpainted should be coated with grease to avoid rusting. Strictly forbid to apply any grease to the surface of the glass. 2.The binocular should be stored in a store-room where the temperature should be kept in the range of +5°C° - 30 С ,and the relative humidity should not be greater than 70%. The store-room should be kept ventilated and it is not permissible to stroe chemicals, such as acids, alkalis, salts and batteries etc. In storing, the binocular should not be kept near but at least 1.5 m from stove or other heating facilities, and it is strictly forbidden to bake the binocular on them. The binocular should not be placed directly on the floor without any mat. and should be kept at least 0.5 m away from the wall to avoid moisture. And it is better to have it suspended or place it on a wooden rack. 3.When the binocular is brought from the cold outside into a warm room or vice versa, do not open the container until the temperature inside and outside the container tends to the same after a period of time has passed ( about one hour for the former and about 15 minutes for the latter ) to avoid damage due to sharp changes in temperature. 4.The binocular should be handled with care, avoiding violent force or collision. When mounting, it shall be steady and reliable. 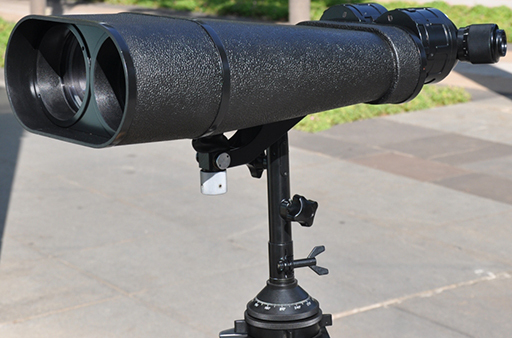 When t is not used in the observing position, it should be covered with protective cover to protect it from strong sunlight, attack of sand-storm and moisture. During transportation, the binocular should be placed securely and reliably in the container. 5.The joints between the glass and the metal and other joints have been coated with sealing material which should not be wiped away in cleaning and in maintenance to prevent dust, moisture from entering the inner of binocular. 6.If any malfunctioning is found, it should be immediately checked so that the trouble is removed in time or sent back to the factory for repair. Never disassemble the binocular at will to avoid damage.